On May 22 at approximately 8:20 p.m. Calcasieu Parish Sheriff’s Office deputies responded to a home on Arsene Road in Lake Charles in regards to a disturbance. Upon arrival deputies spoke with the complainant who advised a women had been hit by a car but was no longer at the residence and had been transported to a local hospital. 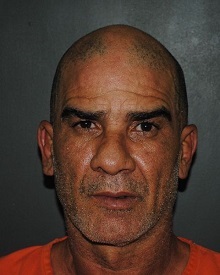 Detectives arrived at the hospital and spoke with the victim, who stated she had been arguing with Victor Ramos, 49, 1887 Arsene Road #45, Lake Charles, her live-in boyfriend. The victim advised detectives Ramos got into his car and began backing out of the driveway and then drove forward, striking her and pinning her up against their mobile home. The victim also told detectives Ramos dropped her off at the hospital and left. A short time later deputies located Ramos at his residence. When deputies spoke with Ramos he advised that he and the victim were arguing and he struck her with his car. He also told deputies he attempted to hide the car. Deputies located the car nearby and observed damage to the front passenger side of the car, which was consistent with the statement given to detectives by the victim. Ramos was arrested and booked into the Calcasieu Correctional Center and charged with second degree battery. On May 24 detectives learned the victim died from her injuries. The following day detectives upgraded Ramos’ charges from second degree battery to manslaughter. Judge Michael Canaday signed the warrant in the amount of $450,000.